I can hear the silence, as it hammers my ear. My senses, I have withdrawn into my Self. only You I can feel, O Mystic ! O Seer! and makes my heart beat that much faster. you move towards me, O Great One! Your eyes look through my Self. matter to me, O Fierce Mother ! Only you, only you are my destination, O Moving One ! Come here ! O Great Devi ! O Brilliant Fire! Carry on your march in the Self of my Self. My heart is now your abode. I imagine myself sitting in padmasana (lotus posture) on the snow in some remote Himalayan mountain. I meditate on Her, the Supreme Mother. There is Silence all around. And then I sense a vibration, a pulsating rhythm. I open my eyes, and see a bright flaming reddish-yellow speck far away. The speck, I realize is not a speck, it is The Mother. 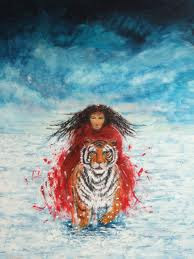 Riding on her Tiger, she is descending to give us Shakti.